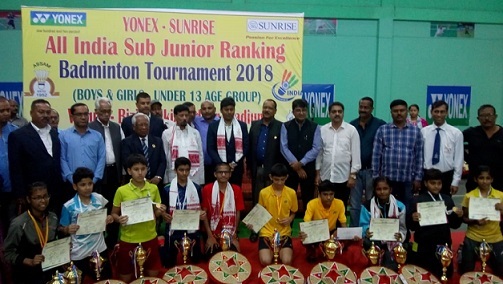 Assam‘s Ankita Gogoi was declared champion in girls’ singles while Chilka Gogoi from the State was declared the runners-up in the girls’ singles in Yonex-Sunrise All India Sub-Junior U-13 Ranking Badminton Tournament held at Tezpur. While in boys’ singles event, Om Gavandi from Maharastra was declared champion and Prajwal Sonawane was declared the runners-up. The national badminton tournament for both boys and girls under 13 started on November and concluded on Thursday. Ankita Gogoi and Chilka Gogoi from Assam clinched the girls’ doubles title of the Yonex-Sunrise All India Sub-Junior U-13 Ranking Badminton Tournament. Apart from Assam, teams from Kerala, Uttar Pradesh, Andhra Pradesh, Maharastra, Rajasthan, and Uttarakhand participated in the national championship. In the final results while Ankita and Chilka from Assam were declared champions in girls’ doubles event, Andrea Sarah Kurien and Shryanshi Valishetty from Kernataka were declared runners-up in the girls’ doubles event. In boys’ Under 13 event, Divyam Arora and Arsh Mahammad from Uttar Pradesh were declared boys’ doubles champions while Animesh Gogoi and Anirban Gogoi from Assam were declared runners-up in boys’ doubles event. While the qualifying rounds were held from November 10, 2018 and November 12, 2018, the main draws were held from November 12, 2018 to November 15, 2018. The prize money for the players was Rs 3 lakh.